Neil deGrasse Tyson is the director of the Rose Center at the American Museum of Natural History and the host of Nova scienceNow, now in its fifth season. He also sat on the National Academy of Sciences Committee, the NASA Advisory Council, the Commission on the Implementation of United States Space Exploration Policy and the selection committee for the Presidential Medal of Science under George W. Bush. Tyson talked with The Root in a wide-ranging interview that covered not only the upcoming season of Nova scienceNow but also the latest scientific discoveries and the politics of dealing with the government. The Root: What's new on Nova scienceNow? Neil deGrasse Tyson: What's different is each show will be addressing a single theme from different angles. "Can We Get to Mars?" is the first show. It talks about if we can get there by propulsion, space suits, food, radiation or meteor impacts. Then, "How Smart Are Animals?" In that one we look at how smart dogs are — wolves, canines. I spent some scary and fascinating time with wolves. Wolves are not dogs! We chose them to live with us — we chose the ones who wouldn't eat us and bred them into dogs. Another theme is "Can We Live Forever?" TR: No. I already know the answer to that one. No. NDT: [Laughing.] We're working on it! OK, can we live much, much longer? We think of cybernetics — artificial materials substituting for human parts — but there are ways we might grow human organs using human tissues. That way we don't risk organ rejection or rejection of foreign things inside your body. It's way beyond stem cells. TR: What's been the best scientific discovery in the last 20 years? NDT: Dark energy. It's a mysterious pressure in the universe that makes us expand faster than gravity should allow. And we call it dark energy because we have no right to call it anything in particular. You can call it Fred. It was discovered in 1998, and it's the opposite of gravity. Another question is, "Where did we come from? What's the origin of the solar system and life on Earth?" NDT: Not far-fetched. Maybe if a meteor hit Mars and sent up fragments with nooks and crannies with bacteria that lived in there and reached Earth eventually — over 10 million years. Bacteria can survive all kinds of insults to their ecosystems and environments. TR: What do you think of Obama's space policy? NDT: I heard the speech he gave at Kennedy Space Center, and it felt like Kennedy saying, "Let's go to the moon." But he said, "Let's go to Mars." It was a great speech! But he's going to phase out the shuttle, and all these people are worried, saying, "Obama, don't kill the space program!" So people are skeptical about whether he was serious [about us going] to Mars after a period of no access to space. I'm finishing up a book called Failure to Launch: The Dreams and Delusions of Space Enthusiasts. TR: That's a depressing title! NDT: It is depressing! But we've got to know what the fears and delusions are. NASA does science on the side. It's in the interest of geopolitics, and you think you manage it by budgeting. It's no good if you say something is great if you don't pay for it. If you look at NASA's budget, [there's] never been more than 32 percent going to science. I had three terms under George [W.] Bush's commissions for aerospace. It was stereotyped that the administration wasn't science-friendly. In every case, people will list one of three things: the environment, stem cells, global warming. Yes, Bush had a relationship with big oil and the Christian right, so I'm not even surprised that he was obstructive in those three areas, but that's not all. The budget for NASA and NIH went up, sometimes by a factor of two or three. Washington is about politics. The politicians are not the problem. That is the currency — politics. In other walks of life, people view politics as keeping them from what they want to do: "I would like my job if not for the politics." Can you see politicians in Washington saying that?! Another stereotype of Republicans is that they're not inclusive or supportive of black causes. I'm with you on that, but there are a couple of acts you can't sweep under the rug. I'm a registered Democrat, but I'm a fan of clear thinking. The Republican Party was invented as the anti-slavery party, and Lincoln was the anti-slavery candidate! And look at Justice [Clarence] Thomas. George H.W. Bush appoints him and people complain. Like you can choose only from one column. George W. Bush's national security adviser and secretary of state were black. Colin Powell as secretary of state was the highest-ranking black there ever was up to that time. That gets forgotten. 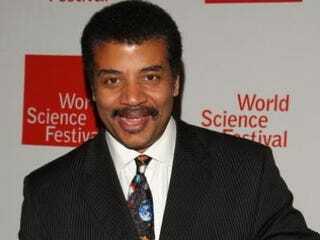 NDT: The person who discovers the asteroid. I have one named after me in the asteroid belt between Mars and Jupiter. They can be named after anything as long as the name's not already used and it's not obscene. And it can't be politically motivated, even though Herschel named the planet Uranus after George III. TR: Yeah, the French weren't having any of that! By the way, one last thing: What about Star Trek's omega particle? NDT: I think it's a bad particle. It's just a science-fiction writer's idea that the discovery of something will end civilization. Arlene McKanic is a freelance writer from Queens, N.Y., and Blair, S.C.